Eurolatte cooling tanks translate all our renowned quality and technology into the milking equipment line. With inner and outer walls manufactured in stainless steel AISI-304, they are equipped with expanded polyurethane insulation, which helps prolong the durability and conservation of the product to be handled. Its top lid and bottom are also built in stainless steel of the same quality above and reflect a cooler that has been designed to provide producers durability and quality with top productivity. In short, it is a product developed by the Brand of Technology. • Ironclad motoreducer designed to drive the vane system. 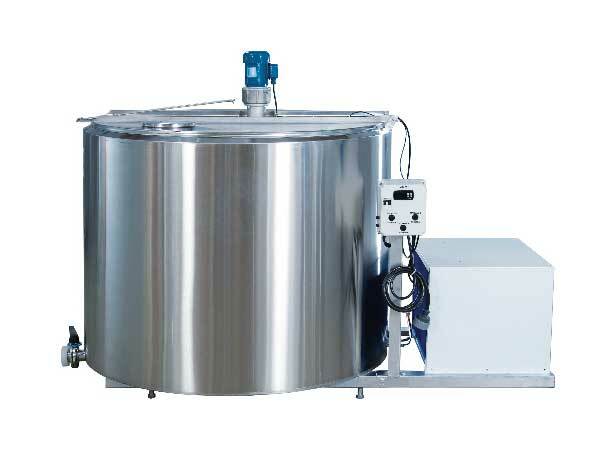 Manufactured with sanitary finishing (stainless steel) for perfect milk homogenization inside the cooling tank. • Electronic system with a digital display for start and stop control of the cooling system and stirring cycle. The system operates based on the milk temperature set by the producer. It can also be operated via manual control and is equipped with safety systems against lighting and electric surges. • Condensing units equipped with safety system against pressure variations (high and low) and for compressor warm-up. The unit also comes with a drying filter and is installed with grounding rods to prevent damages from lighting and electric surges. • Lids and components manufactured in stainless steel AISI-304. There is a second lid to support the sieve or for a better view of the milk. • Stainless steel butterfly-type milk outlet valve equipped with SMS-type thread and tilted bottom for easy milk draining and cleaning of the cooling tank. • The milk is measured via a liter-scale ruler that does not require tables. Base manufactured in galvanized steel with leveling feet. Through an expanded plate, the equipment cools milk from 35ºC to 3ºC in less than 3 hours, providing higher yield and savings.